Jer 28:1-17 Hananiah told me before priests and people: “God says, ‘I'll break the yoke of the king of Babylon and return the king of Judah and exiles.’” Jeremiah: "A prophet who prophesies peace is recognized as authentic only when his prediction is fulfilled." Then Hananiah took and broke the yoke from Jeremiah's neck, saying, “God says: ‘I'll break the yoke of the king of Babylon.’” Later, God told Jeremiah to tell him: "God says: 'By breaking a wooden yoke, you forge an iron one I'll place on the necks of the nations serving Nebuchadnezzar.' The Lord didn't send you. This year you'll die, because you preached rebellion against God." That year, Hananiah died. Ps 119:29, 43, 79, 80, 95, 102 "Lord, teach me your statutes." Take not the word of truth from my mouth. Sinners wait to destroy me, but I pay heed to your decrees. Mt 14:22-36 Jesus made the disciples get into a boat then went to pray. When waves tossed the boat, he walked on the sea toward them. Seeing him, they were terrified: “It's a ghost!” Jesus / Peter: “Don't be afraid.” / “Lord, if it's you, command me to come to you.” / “Come.” He walked on the water toward Jesus but became frightened and started to sink: “Lord, save me!” Jesus, catching him: “You of little faith, why did you doubt?” They got into the boat, and the wind subsided. “Truly, you're the Son of God.” At Gennesaret, people touched his cloak and were healed. One Bread One Body: History is full of examples of false confidence resulting in disaster. God has sent prophets to afflict the comfortable by challenging those who place their confidence elsewhere. How is the Lord challenging me? Passionist: Jesus met the disciples' fears and strengthened their faith, and the mission continued. Faith in Jesus' unlimited reconciling love for all motivated John Vianney to serve; Pope Benedict XVI named him patron of all priests. Jesus tells us to not be afraid. We may be tossed about, but God inspires us in the lives of our spiritual leaders and fellow companions. 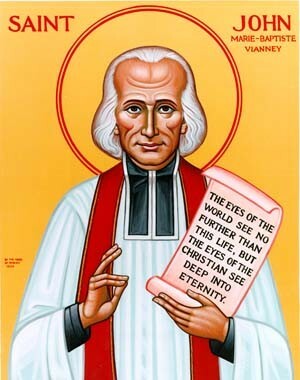 Universalis: St Jean-Baptiste Vianney, Curé of Ars, peasant's son, unpromising priesthood candidate, preacher, full-time confessor; see Catholic Encyclopedia.